MoneyBall Medicine: Thriving in the New Data-Driven Healthcare Market, which includes interviews with dozens of healthcare leaders, describes the business challenges and opportunities arising for those working in one of the most vibrant sectors of the world’s economy. Doctors, hospital administrators, health information technology directors, and entrepreneurs need to adapt to the changes effecting healthcare today in order to succeed in the new, cost-conscious and value-based environment of the future. The authors map out many of the changes taking place, describe how they are impacting everyone from patients to researchers to insurers, and outline some predictions for the healthcare industry in the years to come. Chairman of xG Health Solutions, Vice-Chair of Health Transformation Alliance, and past CEO of Geisinger Health System. As a citizen scientist activist and the mom of children with a genetic condition, I welcome the effect on healthcare of meaningful data, carefully analyzed and appropriately utilized. Moneyball medicine artfully traverses the ever-evolving dynamic landscape and focuses in on the various levers and fulcrums that might make the difference, all the while keeping the consumer in the center. We face a perfect storm: A medical profession, reluctant to emerge from principles of apprenticeship and autonomous practice to evidence based approaches, still largely rewarded by volume based payments. And a healthcare industry, which has accumulated legacy structures never designed for efficiency and interoperability. The combination has resulted in an increasingly unaffordable US healthcare delivery system which covers only part of the populous and has outcomes at or below the level of other civilized countries. Expedient and systematic solutions are further impeded by privacy and safety concerns, which have resulted in well intended, but impractical legislation and heavy regulatory burden. Glorikian’s and Branca’s inspiring book highlights real (entrepreneurial) opportunity to use the power of multisource big data and emerging analytic approaches to get out of this misery and revolutionize the way healthcare is delivered to ever more data-conscious, engaged patients. Christoph Wald, M.D., Ph.D., M.B.A., F.A.C.R. Data has become a significant strategic resource in healthcare. Just as sports, financial services, retail and virtually all other industries have been shaped by data and analytics, so too will health care. Harry and Malorye have done an exceptional job of documenting and analyzing this remarkable transition in the largest and most complex sector in our economy – healthcare. The pace of scientific development is proceeding unlike any other time in the history of healthcare. Precision Medicine is becoming a reality. MoneyBall Medicine provides a compelling overview of how new technologies, diagnostic tests and drugs are being introduced at record speed, and how these advancements and the resulting access to increasing amounts of patient-specific data are rapidly transforming the way healthcare can and will be delivered. Founder and Chief Medical Officer, N-of-One, Inc. The future of healthcare is inevitably data driven. As our ability to collect, sort and analyze data improves, the predictability of what people need is enhanced. This will result in more precise medicine, with better customized and personalized treatment plans for our patients. This book is ahead of its time, bringing together concepts of new innovations aimed at improving healthcare delivery. The convergence of big data and AI is changing the paradigm for the entire healthcare sector – MoneyBall Medicine is a MUST-READ book for entrepreneurs hoping to make an impact in this complex ecosystem. If you want to understand the future of healthcare, you need to read MoneyBall Medicine. Paralleling the data-driven transformation of baseball, Harry Glorikian and Malorye Allison Branca delve into the data and analytic trends which are revolutionizing health care. As this book articulately describes, it’s only through collecting, connecting and understanding data that we will arrive at a patient-centered health care system. Grounded in first-hand accounts, rich in detail, and accessible to practitioners and experts alike, MoneyBall Medicine is a great read and worthwhile investment. Harry and Malorye’s book provides a comprehensive look at how data is rapidly becoming the currency of modern medicine and how this is fueling a market comprised of a diverse set of technologies, approaches and business opportunities. Notably, of course, the goal must be to maximize the rate of exchange, from data to true clinical value. The book recognizes the diversity and lack of synchrony among the critical market factors that impact this exchange, i.e. payers, providers, patients (needs, expectations and hopes), physicians and pharma. By identifying and describing the concerns and priorities of this network, this book can serve as a solid base for advancing towards addressing an even bigger opportunity…that of the unstated and unmet clinical needs that we don’t currently even consider. The U.S. health care system is undergoing sweeping change with profound implications for all Americans, and the change is not waiting for Congress or the White House to determine its fate. Moneyball Medicine defines this pivotal time as we live it, showing how new expectations shape our health care, and how each of us as individuals will be changed by it too. I can’t think of a more compelling and important book for future historians, who will no doubt wonder how our health care system was so dramatically transformed in the early 21st century. 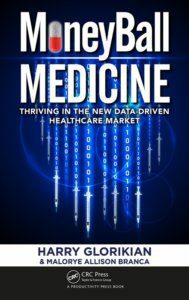 “If the difference between evolution and revolution is the speed of change, then healthcare is now in the mode of revolutionary change,” say authors Harry Glorikian and Malorye Allison Branca in MoneyBall Medicine: Thriving in the New Data-Driven Healthcare Market. Healthcare spending in the US today is simply unsustainable. In this book Glorikian and Branca reveal promising trends that will revolutionize healthcare. I believe their visions are spot on. If you want a glimpse into the future, read this book. It’s fascinating and very well documented. ‘Moneyball Medicine’ takes the reader on a deliberately pragmatic insider’s journey of how raw, objective, hard data is already becoming the driver of better, more cost-effective medicinal decision-making in healthcare today. This book offers something for everyone– from the back-stories bringing observations to life, to the references for deeper-diving, it delivers. In short, if you ever wondered why “It’s the Economy, stupid” has become “It’s the Data, stupid”, read MoneyBall Medicine. After painting a bleak portrait of our current healthcare landscape – an inefficient, often ineffective and expensive system that’s stuck in the 20th Century–Harry and Malorye offer readers a remarkably insightful look at how data-driven healthcare and drug development will offer patients customized, effective, and more cost-efficient solutions in the near future. In other words, these new data-driven model will empower patients to take a more active role in their healthcare decisions. Moneyball Medicine is required reading for anyone interested in the evolution of medicine, healthcare practice and data analytics. We are all now living in a world of data driven medicine. Moneyball Medicine is a really important source for navigating in this new world.